How can we make it so that question words aren't split in the middle of a word? Right now it's really hard to read the questions in our table (last couple of questions). 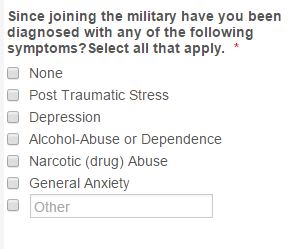 A lot of the folks taking this survey are veterans suffering from traumatic brain injuries, which makes it crucial this is as simple to read as possible. 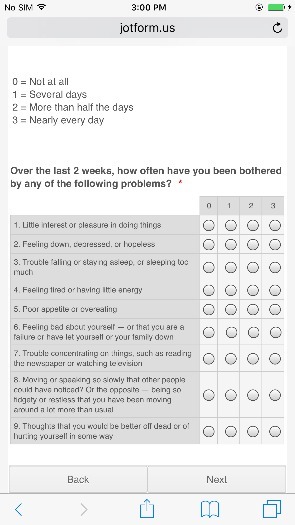 Please try injecting the following CSS code to your form. That seemed to get us part way there! It looks better on my samsung but is still wrapping weird on an iphone and also on a laptop when I shrink the screen some. Here's what iphone looks like. Note that the circles are also shifted some, though that isn't as big of a deal as the words being hard to read. 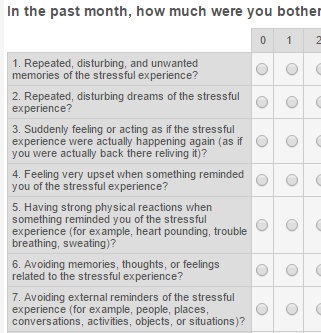 Another thing I noticed is that the "other" box always seems to be overlapping the check box and pushed down. Is there CSS that might fix this? Unfortunately, I am not having an iPhone with me. However, I have checked the form using an iPhone 6s Plus emulator and see that the table is being displayed correctly. If you are using a different device, please let us know so that we can check it further and provide you with necessary assistance. I am checking on the other issue of the Textbox for Other option in the checkbox field. I'll get back to you once I have the code ready. Please inject the following CSS code to the form to reduce the width of the Textbox for Other option in the checkbox field. This is great. Thank you! The other box is now showing up correctly.